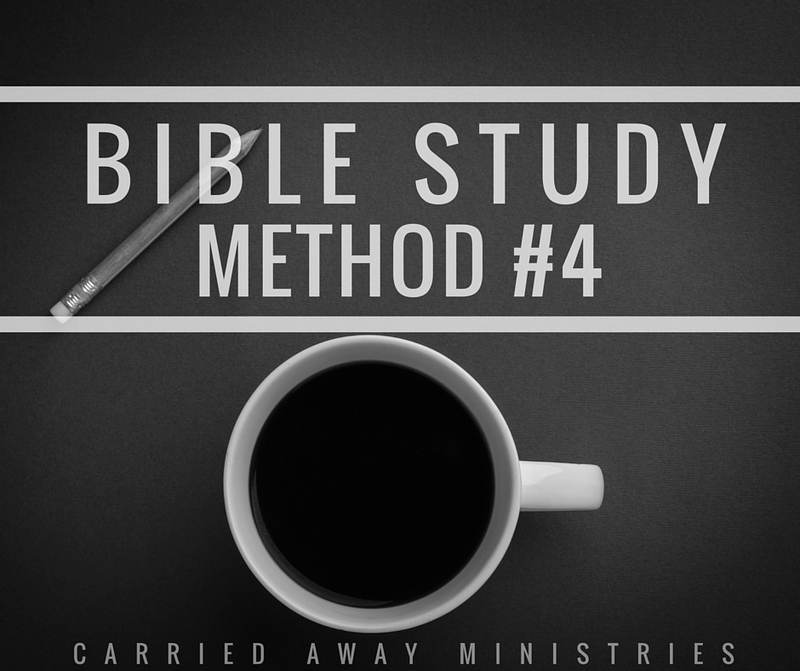 Week 4: How do you study the Bible? 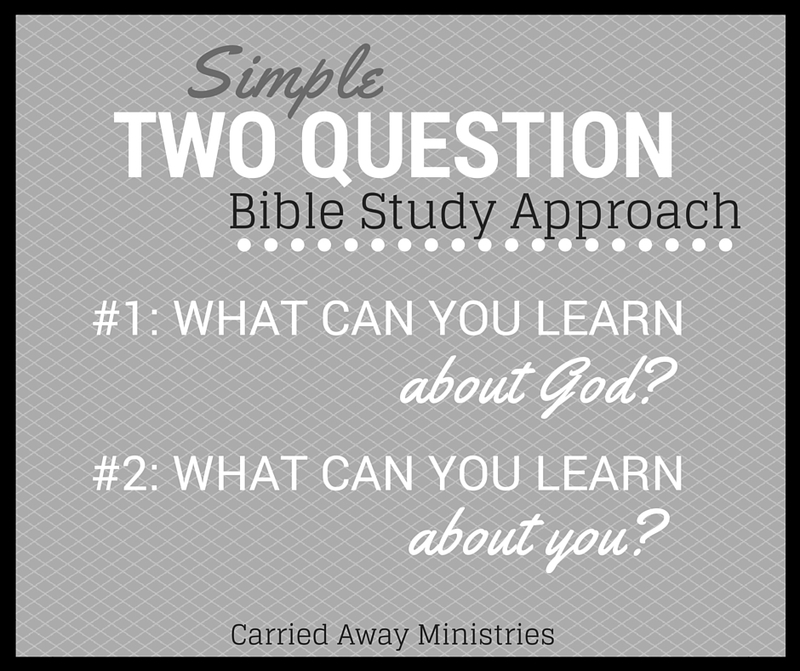 Today we are concluding our How do you study the Bible? series with one last approach. 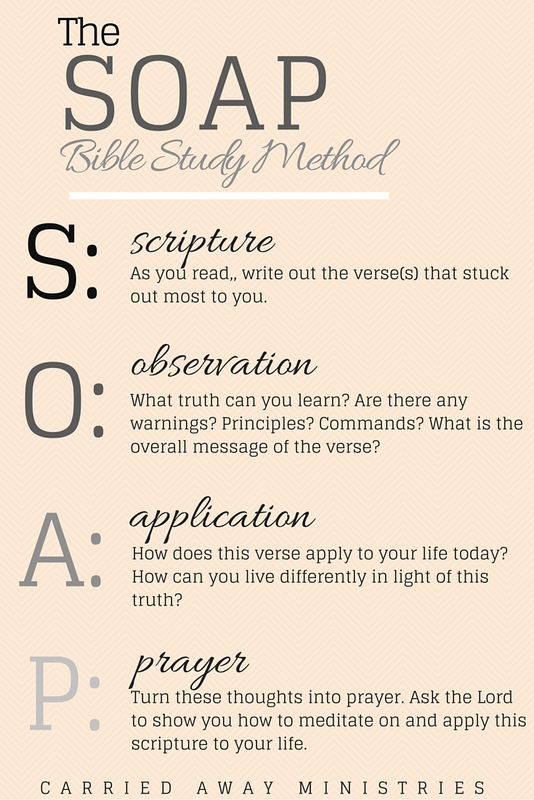 Although we’re probably only scratching the surface when it comes to Bible study methods, I thought these four different approaches provided a little something for all types of learners. To recap thus far, we have already learned three different methods for studying the Bible for yourself. Method #1 was the Two Questions Approach. Today’s approach is actually the method I learned at the youth retreat I spoke at in March. It is the approach that inspired this whole blog series. Come to find out, the method I learned is called homiletics. Homiletics is great way of analyzing a scripture passage in preparation for teaching. And while we aren’t all preachers and teachers, this method is great for any student of the Word looking to dig in and apply the scriptures to their everyday life. Because I have never taken a homiletics course, I hesitate to title Method #4 by that name. Instead, I’m calling it OUTLINING THE BIBLE. I will, however, use the same steps used in homitletics. First I would read through the passage once to acquaint myself with the text. The second time I read, I am looking to summarize the content of the passage, verse by verse. I want to pull out the most basic ideas and shrink the wordy stuff down into small thoughtful chunks. I combine consecutive verses together if they convey the same message. How you break the passage is up to you. This is your summary of what you’ve read. These summaries do not have to be in complete sentences. verse 1: Jesus was led by the Holy Spirit into the desert. verse 2: He was tempted by the devil for 40 days. verse 13: Devil left Jesus until opportune time. Now we are going to divide the content into sections. The number of sections depends on you, but it’s usually between two and four. 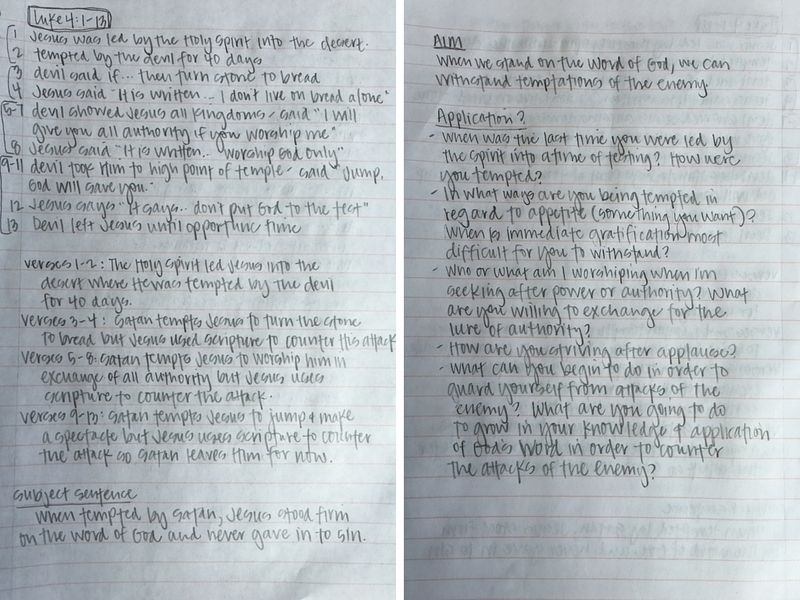 List the verses for each division and give a summary statement in complete sentence form. verses 1-2: The Holy Spirit leads Jesus into the desert where He was tempted by the devil for 40 days. verses 3-4: Satan tempts Jesus to turn the stone to bread but Jesus uses scripture to counter his attack. verses 5-8: Satan tempts Jesus to worship him in exchange for all the authority but Jesus uses scripture of counter his attack. verses 9-13: Satan tempts Jesus to jump and make a spectacle but Jesus uses scripture to counter his attack so Satan leaves Him for now. The next step is to write a subject sentence for the entire passage. (Anyone having flashbacks to English class?) This is probably the hardest part. 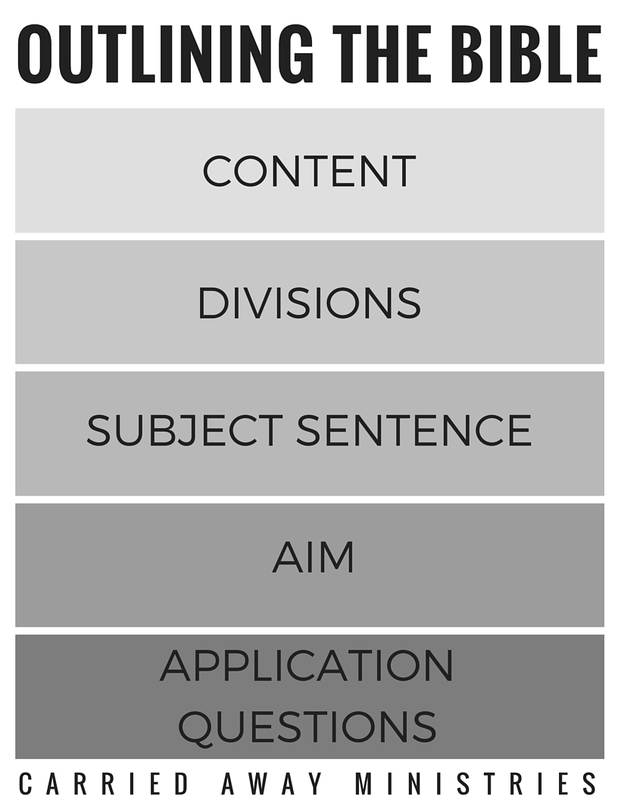 In this step, I focus on my divisions to help create one sentence that sums up the entire text. Again, this should be a complete sentence. When tempted by Satan, Jesus stood firm on the Word of God and never gave into sin. 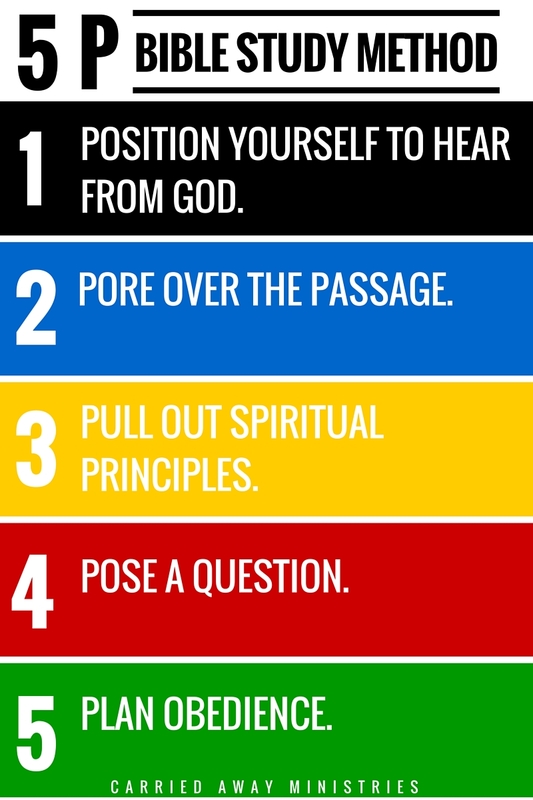 Now that we know what our passage is about, this fourth step get us to the point we want to learn or understand. The AIM is a statement of purpose for the lesson. Again, it should come directly from your divisions. We want our AIM to be a truth that can lead to an action. When we stand on the Word of God, we can withstand temptations of the enemy. Now for the most important part of this process – how to apply the lessons being taught/learned. This is my favorite part because it allows me to walk through the text again and apply it personally. Avoid asking yes or no questions by beginning questions with who, what, when, where or why. Thoughtfully consider your division sentences as you draw these questions out. When was the last time you were led by God into a time of testing? How were you tempted? In what ways are you being tempted in regard to appetite (something you want)? When is immediate gratification most difficult for you to withstand? Who or what am I worshiping when I’m seeking after power and authority? What are you willing to exchange for the promise of authority? How are you striving after applause? What can you begin to do in order to guard yourself against the attacks of the enemy? What are you going to do to grow in your knowledge and application of God’s Word in order to counter the attacks of the enemy? And that’s it! Easy, breezy, right!?! This last approach is definitely the most labor intensive but in the end, you will have a clear understanding of the content and how it applies to your life. As I said at the beginning of this post, I hope this series has been useful to you. No matter which method of study appeals most to you, it is only effective when we put into practice. The more we dig into the Word – the more we approach it as an opportunity to meet with and be changed by our Living God – the more we will see the fruits of our labor. Now that you’ve seen all four approaches, which do you think is most do-able on a day-to-day basis? Will you begin to use any of these methods regularly?